Vegetable Frittata makes a super-quick, delicious supper dish which also happens to be healthy too. It may not be a classic British food but it is one that is much-loved here. What is not to love as the Frittata can be eaten warm with a side salad, or left to cool and makes a great lunch-box treat or for sliced for picnics and parties. The Frittata as well is versatile. You can play with the contents as much as you would like so pull out your or the kids' favourites and make a great dish everyone will love. Heat 1 tablespoon of the olive oil in a 23cm (approx) frying pan and cook the onion on a low heat for about 5 minutes until soft. Take care not to burn. Add the garlic, stir, then add the cooked vegetables and cabbage. Cook for a further 2 mins. Season the beaten eggs with a twist of black pepper and a little salt at the last minute (adding salt before this time can make the frittata tough). Give the eggs a good whisking. Tip the beaten eggs into the cooked vegetables in the frying pan and stir. Add the parsley and stir well. Turn the heat down to low and cook until the sides and centre of the omelette is barely set. 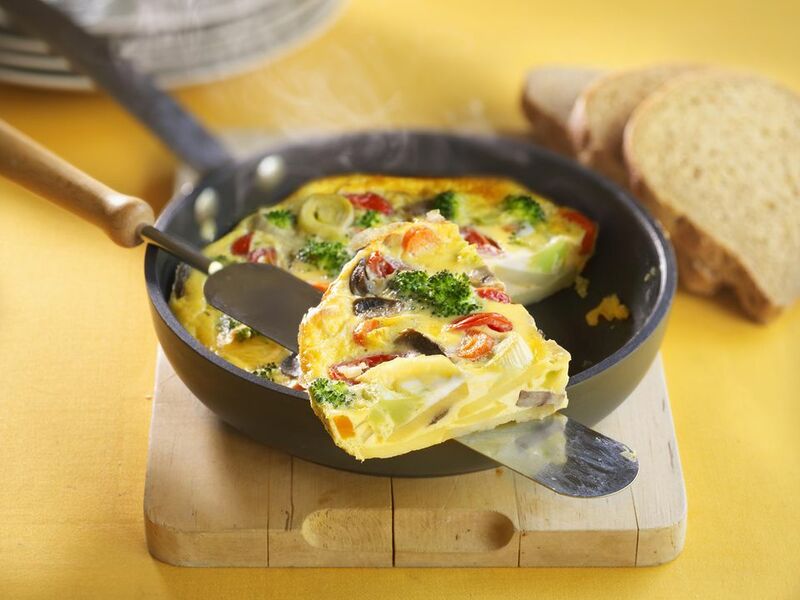 Turn the frittata over onto a large plate, then transfer back to the frying pan with the uncooked side downwards. Remove from the heat, and leave to cool slightly. Cut into wedges and serve with a green salad. **For a Frittata you can use any cooked vegetables you have to hand or to use up which makes it a surprisingly cheap dish. Favourites are cold diced potato, peppers, courgettes (zucchini), and shredded leeks. You are limited in what you can create only by your imagination. This is why this the Frittata is so loved. The Frittata is Italian in origin (a give away by the name) but translates so well into any cuisine as it is an ideal way to use leftover vegetables. Be as inventive as you like. In Britain, the remains of a Sunday Roast are often made into a Bubble and Squeak. Why not give a Frittata a go instead?